Well it’s December again, the shops are now well and truly filled with Christmas goods, everywhere you go they’re playing those terrible Christmas songs (personally I could do without them) and Mother Nature herself has decided to join in and lend a bit of Christmas like cheer to the UK. The snow has fallen all across most, if not all of Britain over this last week. Here in Salisbury, we’ve been pretty lucky to miss out on the full scale snowed in status, but it was falling thick and fast last night. In the end I’d say we had around 3 inches, but other areas had much more. It’s amazing how just a little bit of snow can bring this country to its knees. We’re a strange bunch the British, we seem to be so preoccupied with our weather, but we’re never prepared, I can’t quite work out how that should be? Answers on a postcard to Wealie please. Anyway it was lovely and magical to watch the big fluffy flakes falling last night with Ben. 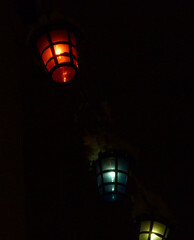 I took these two pics on my panasonic lumix as I was feeling too lazy to get out the Pentax K7. 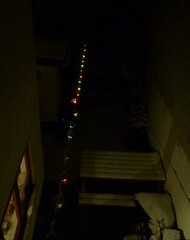 I loved the way the snow was settling on top of the Christmas lantern lights. Below is a very short little video that I took on the iphone of the snow falling. The flakes were just so large and fluffy that it was too much to resist. Enjoy the winter wonderland folks! This entry was posted in My Blog, Photography, Wealie News and tagged Christmas, Christmas Lanterns, Christmas Lights, photo, photograph, ruth weal, snow, snowed, snowfall, snowflakes, snowing, snowy, wealie, wealie's winter wonderland, winter, winter wonderland. Bookmark the permalink.